"Providing a fly-on-the-wall vantage of the rising diplomatic panic that sent shudders through world capitals" (Toronto Star), Kill Khalid unfolds as a masterpiece of investigative journalism. In 1997, the Israeli intelligence agency Mossad poisoned Hamas leader Khalid Mishal in broad daylight on the streets of Amman, Jordan. As the little-known Palestinian leader slipped into a coma, the Mossad agents' escape was bungled and the episode quickly spiraled into a diplomatic crisis. A series of high-stakes negotiations followed, which ultimately saved Mishal and set the stage for his phenomenal political ascendancy. 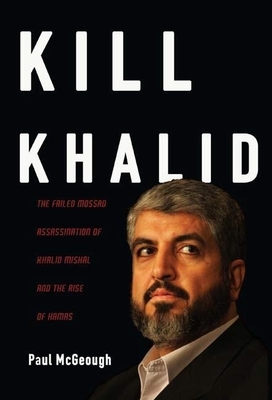 In Kill Khalid, acclaimed reporter Paul McGeough reconstructs the history of Hamas through exclusive interviews with key players across the Middle East and in Washington, including unprecedented access to Mishal himself, who remains to this day one of the most powerful and enigmatic figures in the region. A "sobering reminder of how little has been achieved during sixty years of Israeli efforts in Palestine" (Kirkus), Kill Khalid tracks Hamas's political fortunes across a decade of suicide bombings, political infighting, and increasing public support, culminating in the battle for Gaza in 2007 and the current-day political stalemate. Paul McGeough is the chief foreign correspondent for and a former editor of Australia's Sydney Morning Herald and the author of several books on the Middle East, including Kill Khalid: The Failed Mossad Assassination of Khalid Mishal and the Rise of Hamas (The New Press), which won the 2010 Premier's Book of the Year award in Sydney, Australia. He has twice been named Australian Journalist of the Year and was awarded the Johns Hopkins University-based SAIS Novartis Prize for excellence in international journalism and eight Walkley Awards for his reporting on crisis and conflict. He lives in McLean, Virginia.